If you find when you walk that you struggle to lift your foot or that you trip often (this is known as Foot Drop), FES may be an option for you. FES stands for Functional Electrical Stimulation. 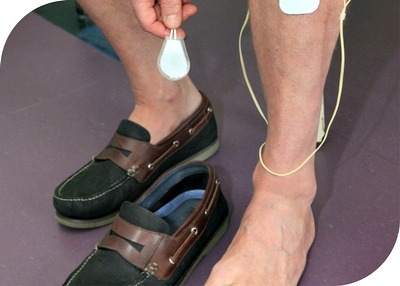 Electrodes are placed on the skin and electrical stimulation is sent through your legs to help your muscles as you step. The device is usually worn attached to the top of your clothing and the electrodes are placed specifically to stimulate one of the nerves just below your knee. Please be aware FES is not suitable for everyone so please talk to the physiotherapy team. For more information please speak to one of the physiotherapy team in the Centre or call 0118 901 6000 to book an assessment.